Good work. It's simple and I like it. It seems to convay a relaxing feeling. Simple, clean, nice and rather original. I like it. Niice use of filling it in.. looks nice.. I wouldn't have noticed that you drew stuff in until you pointed it out. Very authentic. Nice, I have another wall with this image but I think I like that version better. I love it! But I think it would look nicer without the lines under the text. 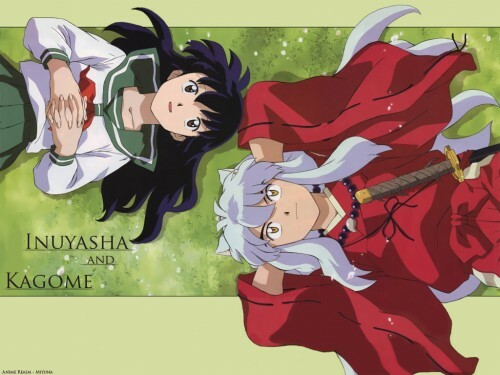 very cool pic of kagome and inuyasha! Thank you for your share!! sylvacoer likes this one very much! Yay, Inu/Kag! It looks great. Love the simplicity for a change. Inuyasya and Kagome very nice wallpaper. it looks like Inuyasha isn't resenting being here... not too much that is. inuyasha a half yaukai wtih kagome!! what a couple!!!! i'll use it for sure!! !